Boy band McFly talk to the BBC News website as they gear up for the US launch of their new album and their first Hollywood movie. In Just My Luck, a romantic comedy starring Lindsay Lohan, British foursome McFly play a young guitar band from England trying to make it big in America. It is a fictitious scenario the boys hope will soon be transformed into reality. A week spent in the States recently saw the group attend an early Hollywood screening of the film and meet the local media. Between appearances, the boys spoke to the BBC News website about their ambitions and first impressions of Hollywood. "This is like the entertainment capital, isn't it? It's really dreamy," said drummer Harry Judd. "It's such an amazing and beautiful place. You go along the street and there's so much character with the restaurants and everything. It's quite surreal being here." For a band still trying to find their feet in the world of showbiz, Los Angeles appears to have struck a chord. "In England, if you just talk about yourself you come across as arrogant, but over here it's really cool," said singer Tom Fletcher. "Everyone comes over and tells you exactly what they do and what they've done." McFly have had a meteoric rise since becoming the youngest group since the Beatles to debut at number one with their first album. It is an achievement that has aroused much interest in the US. "In a lot of American interviews it's come up, so it's really nice," said vocalist Danny Jones. "We're not big-headed about that kind of thing though," added Judd. However, the boys know they have everything to prove if they are to make an impact on the US music scene. "It's like when we were starting in England - everything's new and exciting again," said Fletcher. "The success we've had doesn't mean anything over here, so we have to come over and work hard." "It's a big place to crack but we'll do our best shot," added Jones. "We're not going to just expect it'll happen," agreed bassist Dougie Poynter. 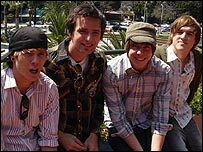 When McFly were signed to appear as themselves in Just My Luck, they did not expect to have major roles in the film. But as the script developed, they were given speaking parts as well as an opportunity to contribute original songs to the soundtrack. 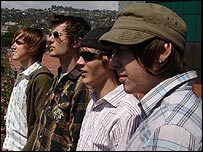 The Just My Luck CD - which features songs from McFly's first two UK albums - will be released next month in the US. However, the band are quick to point out the film is more notable for their musical contribution than for their performances as actors. First the Beatles, now McFly - but is America ready for them? "We're not actors to be honest," said Judd. "But it's a great opportunity for us and to get our faces out there in America." Another bonus was the chance to work with Lindsay Lohan, a star in the US thanks to such films as Freaky Friday and Mean Girls. "We were pretty nervous about meeting her for the first time," admitted Fletcher. "But about a week into filming she took us out to dinner with her family. It was a nice way to break the ice. "She's just a normal girl," added Jones, who - like his bandmates - is undeterred by the prospect of courting the same media interest that has made Lohan one of the most talked-about celebrities in Hollywood. "As much as people deny it, that's the main reason why people do it," said Judd. "You say to kids now 'What do you want to do?' and they say 'I want to be famous'." Just My Luck opens on 21 July in the UK.